Allergic Rhinitis also known as hay fever is a common allergic condition found in people with low immunity. Allergic Rhinitis is an allergic reaction to pollens and dust. It is classified into two types based on the period of occurrence. They can be cyclically occurring during seasonal changes or persistent throughout the year. Environmental factors play a role in the development of allergic rhinitis and the common allergens include dust mites, plant pollens and pets. When a person is exposed to any of the allergens or dust, the inner lining of the nostrils obstructs the foreign particles from entering into the system. A sticky mucus is produced inside the nostrils that prevent the entry of the allergens. 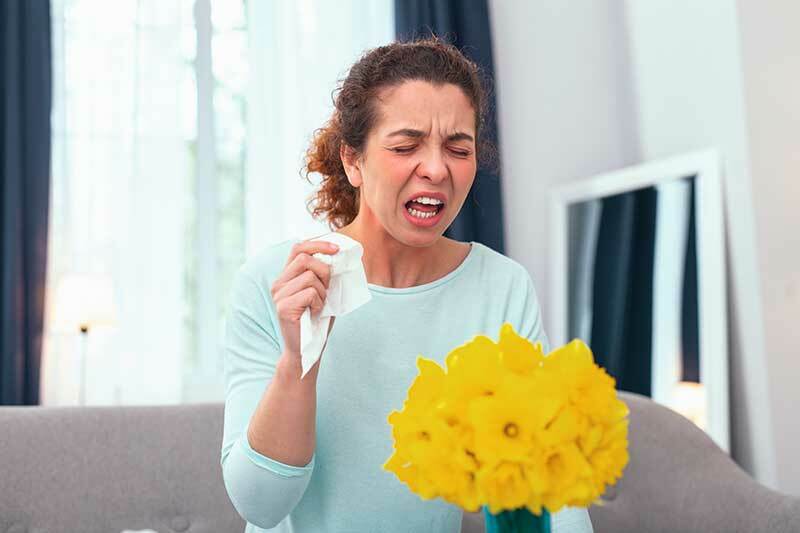 In the person with low immunity, this obstruction may not occur and the small particles in the air may enter the nasal passage causing irritation and inflammation. In Ayurveda, hypersensitivity of the nervous system and low immunity is considered as the cause of allergy in the body. This can be caused due to indigestion, inhalation of smoke and dust, lack of sleep in the night, drowsy throughout the daytime, exposure to cold air and the suppression of natural urges. According to Ayurveda, the presence of accumulated toxins in the body is the main cause of allergic rhinitis. Accumulation of toxins can occur from poor digestion and low immunity which inturn aggravates the levels of Kapha in the body and increases the risk of developing an allergy to various factors. At Ayur Bethaniya Ayurveda Hospital, we believe in balancing the three doshas in the body and to improve the immunity power of the patient. The treatment plan is customized and involves clearing the sinuses through Nasya treatment and Vamana Panchakarma procedures to alleviate the relevant dosha and detoxify the body. Ayurvedic decoctions are administered to improve the digestion process, along with dietary and lifestyle alterations to strengthen the immune system. All ayurvedic medications are made using organic herbal formulations for excellent results. The patients are also advised to follow specific diet plans for long-lasting results. The diet plans include avoiding fried and spicy food, fermented food items and limitation of tea and coffee consumption. All ayurvedic medications are directed to improve the immunity and the respiratory system in the body. Engaging in low levels of physical activity or yoga asanas helps improve the breathing process and completely rejuvenates the body and mind. At Ayur Bethaniya Ayurveda Hospital, we provide safe and effective Ayurvedic herbal formulas and treatment plans that are customized as per individual patient condition to treat and recover from severe allergic condition without any side effects. To know more about allergic rhinitis treatment plans and treatment cost, book an appointment now.